Singapore took its most significant step in its cashless drive by appointing NETS yesterday to bring e-payments to all 12,000 stalls at hawker centres, canteens and coffee shops with a single, unified system. As the country's first "master acquirer", e-payment firm NETS will supply hawkers with hardware that can accept e-payments from 20 sources for a start, including e-wallets like Singtel Dash and GrabPay, transport cards ez-link and NETS FlashPay, and credit cards such as Visa and Mastercard. NETS will settle accounts with the hawkers, which means they no longer need to put up with the hassle of dealing with different e-payment firms. The all-in-one e-payment terminals, which can read contactless and chip-based cards, and process QR code payments, will also be rented to hawkers for no charge for the first three years after they sign up with NETS. Transaction fees of 0.5 per cent will be borne by the Government during the period. Stalls have until August 2020 to apply for the fee waivers. NETS said that it has not decided what the charges would be after the three years. By addressing most of the obstacles cited by hawkers, including high transaction fees and having to deal with different firms to receive payments, the Government hopes to convince more hawkers to take the cashless leap. In Singapore, about 40 per cent of dining occasions take place at coffee shops, hawker centres and canteens. NETS' appointment comes after Enterprise Singapore, the National Environment Agency and the Housing Board jointly called for bids from the industry in May. Mr Ted Tan, deputy chief executive officer of Enterprise Singapore, said in a statement yesterday: "The Government is enhancing the dining experience by providing customers with a unified e-payment solution where transactions can be made easily, quickly and securely." 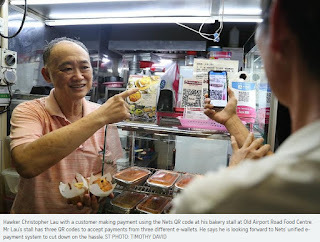 Put up on the counter of Mr Christopher Lau's bakery stall at Old Airport Road Food Centre are three QR codes to accept payments from three different e-wallets: PayLah, NETS and Fave. The 65-year-old hawker looks forward to having a neater solution. He has no counter space for more QR codes or payment terminals. "It is also a hassle to manage three settlement accounts with the three e-payment firms," he told The Straits Times in Mandarin. These pain points, and more, will now be addressed by NETS, which is owned by DBS Bank, OCBC Bank and United Overseas Bank. The three-decade-old e-payment firm has just been appointed by the Government as the "master acquirer" to bring e-payments to all 12,000 stalls at hawker centres, canteens and coffee shops in Singapore with a single, unified system. NETS will now be the single touchpoint for about 20 payment schemes, including e-wallets such as Singtel Dash and GrabPay, transport cards such as ez-link and NETS FlashPay, and Visa and Mastercard credit cards. NETS is the only party to reconcile accounts, removing the hassle of dealing with different e-payment firms to receive payments. Payments to merchants will be settled within one business day for transactions made before 11pm. Transactions made via American Express, Mastercard and Visa will be credited within two days after the close of the business day. Transaction fees of 0.5 per cent will be borne by the Government for the first three years after hawkers have signed up with NETS. The all-in-one NETS e-payment terminals - which can read contactless and chip-based cards, and process QR code payments - will also be rented to hawkers for no charge for the first three years. In announcing NETS' appointment yesterday, Mr Ted Tan, deputy chief executive of Enterprise Singapore, said hawkers will benefit from a "cost-effective and productive model" to accept and process e-payments from customers and suppliers. Hawkers have to sign up before August 2020 to get the three-year fee waiver. NETS said it has not decided what the charges will be after the three years. Mr Lau said three years is a long time to benefit from the freebies. "I can decide after three years if I want to pay the fees," he said. Mr Lim Heng, 60, who sells hor fun at Old Airport Road Food Centre, said: "If the future is cashless, I better move with the times." NETS' appointment comes after Enterprise Singapore, the National Environment Agency and the Housing Board issued a call for collaboration that ended in May. This came on the heels of Prime Minister Lee Hsien Loong's call in his National Day Rally speech last year to unify e-payment systems. Mr Benson Low, 55, who sells laksa and prawn mee at Tanjong Pagar Plaza Market and Food Centre, said more suppliers must also go cashless. "Many hawkers prefer to accept cash as they need to pay their suppliers in cash," he said. This prompted Mr James Lloyd, consultancy firm EY's Asia-Pacific fintech leader, to suggest that the Government start a similar initiative for hawkers' suppliers. "Ideally, you want the whole supply chain operating on the same payment flow," he said. However, he also acknowledged that changing longstanding hawker behaviour will not be easy. "Settlement on the next business day is still no match for the immediacy of cash." Mr Lin Yih, director of smart-card systems developer Digital Applied Research and Technology, said effort must be made to make sure the unified system works at all times. "If transactions do not go through, people's faith in the system will be affected and it will be hard to rebuild trust later," he said. What are the payment schemes that will be accepted? What are the benefits for hawkers? 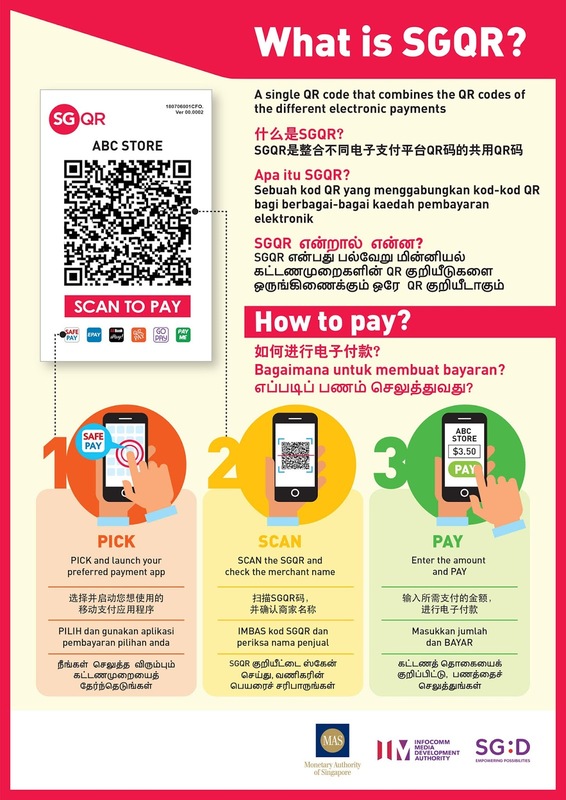 A national QR code payment standard, dubbed SGQR, is all that hawkers need to display to accept and process transactions from the 20 payment schemes. NETS is the only party to reconcile accounts, doing away with the hassle of dealing with different e-payment firms to receive payments. Payments to merchants will be settled in one business day for transactions that are made before 11pm. Transactions made via American Express, Mastercard and Visa will be credited in two days after the close of the business day. Transaction fees of 0.5 per cent will be borne by the Government for the first three years after hawkers sign up with NETS. The all-in-one NETS e-payment terminals - which can read contactless and chip-based cards, and process QR code payments - will be rented to hawkers free of charge for the first three years. They need not carry multiple cards or download multiple e-wallets, which is the case today as few hawkers accept more than one e-payment mode. A universal QR code which allows consumers to scan and transfer funds from as many as 27 e-payment apps was launched yesterday, marking a significant step in Singapore's drive to build a national cashless system. 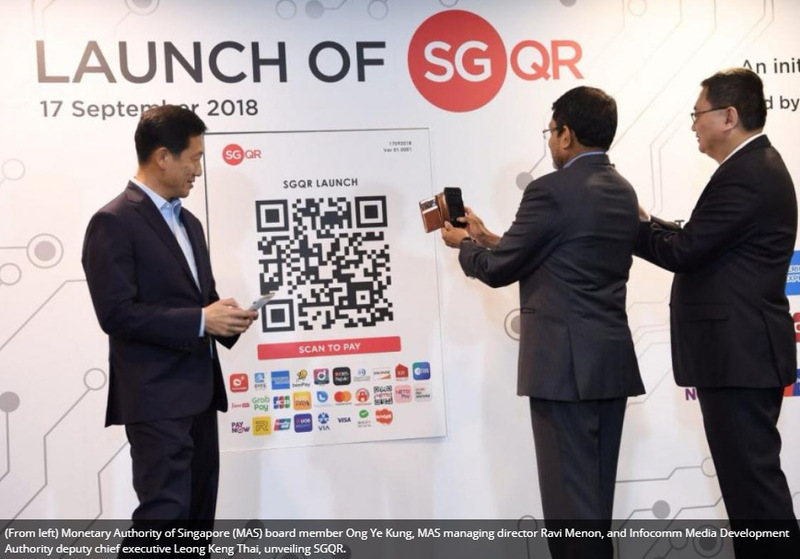 Dubbed SGQR and described as the world's first unified payment QR code, the system will allow customers to choose from a host of e-payment solutions such as GrabPay, Dash and Nets, and enable businesses to accept them. Meanwhile, merchants will also be freed from the chore of displaying multiple QR codes. Monetary Authority of Singapore (MAS) board member Ong Ye Kung, who is also Education Minister, announced this yesterday, saying that the last few jigsaw pieces are finally coming together to help Singapore build its national cashless system. Nets was recently appointed the single touchpoint to supply a unified system at hawker centres, canteens and coffee shops that can accept e-payments from 20 sources. Mr Ong also said that Fast, an instant online interbank funds transfer system, will be opened to non-bank players such as Grab and Razer to allow consumers to transfer funds among more e-wallets. Meanwhile, SGQR gives some momentum to the cashless push. Its technical specifications were unveiled in November last year. After the 27 payment companies worked the specifications into their payment systems, SGQR is now ready for commercial use. Announcing that SGQR will be rolled out later this month, Mr Ong said: "QR code payments have been growing, and many cash-intensive merchants, such as hawkers, are accepting them. But every scheme... all issue their own QR code. This causes confusion." The authorities foresaw the problem a year ago, which led to the development of SGQR. It is the work of an industry task force co-led by MAS and the Info-communications Media Development Authority. The move follows Prime Minister Lee Hsien Loong's call at last year's National Day Rally for an interoperable e-payment system in Singapore that is simple to use. 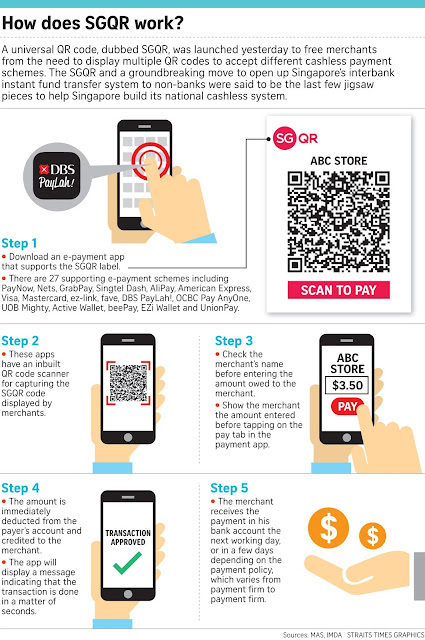 The 27 supporting e-payment schemes include PayNow, Nets, GrabPay, Singtel Dash, AliPay, American Express, Visa, Mastercard, ez-link, fave, DBS PayLah!, OCBC Pay AnyOne, UOB Mighty, and UnionPay. Thousands of QR codes will be replaced with SGQR labels starting this month, with the new universal sticker showing the QR payment options that the merchant accepts. The replacement exercise, beginning with merchants in the Central Business District, will be completed over the next six months. Supporting the launch of SGQR, Ms Sherry See, 37, owner of Utopia Apparels in Kampong Glam, said: "My shop counter, which currently displays the GrabPay and AliPay QR codes, will be cleaner." Still, not all merchants would have signed up with all 27 e-payment companies even if the code on the displayed sticker is theoretically compatible. Toast Box's regional general manager Vincent Lim said that working with all the players would mean more work in reconciling accounts at the end of the business day. "We work only with the bigger players as they would have accounted for most of the consumers out there," said Mr Lim. The initiative fronted by Nets to bring a unified e-payment system to hawker centres, coffee shops and canteens will also support SGQR. Now, some 70 per cent of hawker transactions are done using cash. Conversely, 70 per cent of transactions at malls are already cashless.